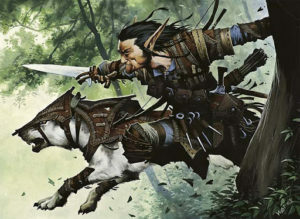 Since early in the Dungeons & Dragons 5th edition days, a significant portion of the playing community has held a low opinion of the Ranger class, & in particular the Beast Master Ranger Archetype. Many have leveled charges that the Beast Master Ranger (BMR) is simply underpowered relative to the other classes & sub-classes in D&D 5e. The gist of the complaints seemed to stem around the fact that the BMR’s Beast Companion could only make attacks at the expense of the BMR himself making attacks. This was only partially alleviated by the fact that the Beast Companion could at least make a Help action (in exchange for the BMR’s bonus action) at level 7, & then could make to attacks at level 11. I never really saw this as much of a problem. In my mind, most people’s complaints about the underpowered BMR were centered around two sub-par ways of thinking about D&D. First, since this is a cooperative team game, it shouldn’t be significant if one particular character is slightly underpowered relative to the other player characters. Second, people who complain about a character being underpowered are almost always thinking only in terms of combat-centered min-maxing. Since combat is only one of the classic D&D “Three Pillars of Adventure” (Exploration, Social Interaction, Combat), I don’t find arguments that the BMR is underpowered to be particularly compelling. Nonetheless, Wizards of the Coast has released multiple experimental fixes for the Ranger class in their “Unearthed Arcana” series, & in their most recent release—“The Ranger, Revised” I believe they’ve hit a home run. Let me tell you why. First, they’ve added a third archetype (now called “Conclaves”) to the Ranger subclasses. This is a much-needed addition. One of my sons plays a Ranger in our current campaign, & he has pointed out to me that the Ranger subclass options were among the smallest of all of the 5e classes. There are only two in the Player’s Handbook, & no new Ranger subclasses in any other official resources, such as the Sword Coast Adventurer’s Guide. So any new addition is very welcome. This newest “Unearthed Arcana” release includes the Hunter Conclave, the Beast Conclave, & the Deep Stalker Conclave. The Deep Stalker Conclave is largely unchanged from when it appeared in an earlier “Unearthed Arcana” article about Underdark-specific character options. When it first came out, I thought it was quite good & said as much in a Twitter conversation with Mike Mearls. So I’m glad to see it nearly completely preserved here as a Conclave option. This Conclave is focused around sneaking around in the dark, quick first strikes, and acquiring specific spells at 3rd, 5th, 9th, 13th, & 17th level. The Hunter Conclave is essentially the same as it appears in the Player’s Handbook, so I don’t have a lot more to say about it than has already been said by many others at this point. The Beast Conclave is the new BMR, & boy, have things changed! This option now focuses more than ever on a specific animal companion that levels along with your character. It has its own initiative roll & is free to take any actions it desires, including all the standard combat actions. This is great news for BMR fans who want to truly fight alongside their Beast Companions. The beast also has access to all the advantages of its owner’s Favored Enemy features. In exchange for this, the Beast Conclave Ranger is the only one of the three Conclaves that never levels into an Extra Attack feature. However, at level 5 the Beast Companion can actually attack twice in a turn, so the Ranger character is actually generating 3 attacks per turn. (It strikes me that this may be a touch overpowered for such a low level…play-testing over the coming months will make things more clear.) Overall, this new BMR is a vast improvement, & I’m sure he’ll draw much more play from the community in the near future. In addition to the Conclave-specific changes I’ve already described, the overall Ranger class has a couple of modified features that, in my mind, certainly take the class from least-powerful to possibly overpowered at low levels. The Favored Enemy feature now exists in two varieties. At level one, the Ranger chooses from a group of broad, more-common categories of potential enemies, & at level 6 he selects again from a more “exotic” list (such as dragons, elementals, aberrations, etc.) The combat bonuses it provides are quite strong for a first level character. The Natural Explorer feature has also been strengthened. Favored Terrain is no longer a thing. Instead, the Ranger has a handful of general, interacting-with-the-landscape bonuses and a couple of very combat-specific buffs. The Ranger now always has advantage on Initiative rolls. In addition, he gets advantage on attack rolls against creatures that have not yet acted (a “first strike” bonus of sorts). These two combat abilities are, again, quite strong for a first-level character, & it occurs to me that WotC might be overcompensating a bit for the prior Ranger class’ presumed weakness. Regardless of those concerns, I am overall very pleased with what WotC has given us here. I think with a touch of fine-tuning, this new Ranger class will prove to be exactly the fix the D&D community has been clamoring for.